You can download this free MCA Mini Project, Download Files for MCA Mini Projects are available you can download from IGNOU CLOUD. This Project is very small and it can be only used for IGNOU Mini Project and you can also use it as your Collage small projects other than IGNOU. 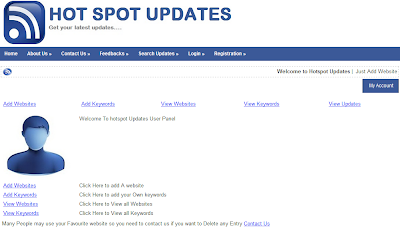 Hot spot updates provide user to get latest information of their favorite website a user can register with this website and then he/she can get regular updates from any website which a user add, user can search others user websites also and he can see and website details and if he interest in other user website he can subscribe that website in his list, by this user create a website list from which he wants update to get updates by RSS Feed if a website provides rss Feed then user have to enter the RSS feed to get updates to his profile, because RSS gives exact what we want and if we get updates from URL may b we get many things with Latest Updates. But both are effective ways to get updates, when a user add a website he will add a website category and Keywords , by keywords other users can search his website content or by category other user can see the website on that category list. 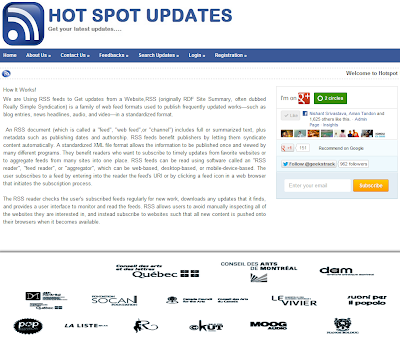 The hot spot update is a website where user can see their favorite websites update details they can specify keywords to get their website details. 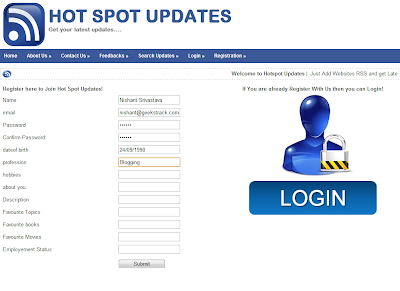 In this website user can register here he has to enter his details like email phone no password and profession, email is the username of the user after registration he has to login with his email and password , after login user will visit his profile where he can see all his details which he fills at the time of registration. This is very simple and small project, you can use it for IGNOU MCS-044 Mini Project, and you can check the source code and database if you want to make it more complex and want to add other features also. Please don't forget to subscribe email alerts for more free projects in future.